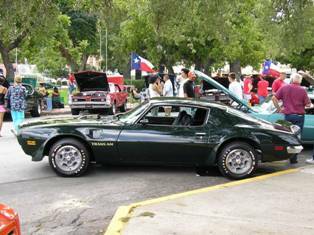 The South Central Texas Chapter held their 7th Annual Classic Car Show in Seguin, Texas on Sept. 16, 2006. We had 127 classic cars and the show was a great success. There were some very nice Trans Ams and Firebirds shown, several owned by Club members and more in the non Club classes. We were very fortunate to have a very rare ’73 Brewster Green Trans Am Super Duty 455, 1 of 252 produced, shown at our show. It is a gorgeous concourse quality rotisserie restoration and we were grateful to our son, Greg San Marco, for bringing it to the show. Thanks to The National Firebird & TA Club for sending several door prizes and goody bag items that helped contribute to a wonderful show. 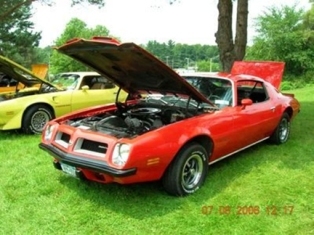 As appeared in Hot Rod magazine as a possible Firebird Trans Am built on the forthcoming Camaro body. Is it just us or does this Trans Am sketch look better than the Camaro it’s based on? This rendering is by Kevin Morgan of Canton, Pennsylvania and we say this needs to be built. If you agree let GM and Pontiac know at General Motors Corporation, Box 33170, Detroit, MI 48232 or 480-210-701 or http://www.gm.com/utilities/contact_us/contact.jsp?deep=contact . Thanks to Beverly Reedy, Charles & Katie Singer, Keith Fuerst and all of the other contributors to this issue! Also many thanks to Todd Stahr on his continuing technical help to our members on our new message board at http://www.firebirdtaclub.com/. We have a new and improved club message board. You can access through the club website at http://www.firebirdtaclub.com/ or directly at board.firebirdclub.net. We have a members only section of the message board. You can use the user id and password on page 3 of each Eagle or you can get a personal id and password. To do so, register and then logon to the message board and send a message to us with a reply in this section or via email. This allows you to access the MEMBER ONLY QUESTION & ANSWER and UPKEEP & PERFORMANCE HINTS area. It also allows you to post items in the FOR SALE and WANTED sections as well as post photos in the MEMBER PHOTOS area. We now offer eMembership at a reduced rate of $20 per year. This membership offers the eEagle and on-line access to the “Members Only” section of the website which includes on-line versions of the Eagle, tech staff contacts, member shop recommendations, etc. No membership materials will be mailed to this type of member. We are still looking for additional technical staff people. If you would like to join the technical staff, please contact us. Remember we will send out the eEagle, our email newsletter in addition to the regular Eagle for members that have given us their email address. Our website address is http://www.firebirdtaclub.com/ and our email address is info@ firebirdtaclub.com. The website has a “Members Only” section on the web site. This section contains technical staff contact information, recommended repair shops, spare parts lists that members have sent in as well as complete current and past issues of the member magazine which can be viewed on-line or downloaded for printing. Thanks for all of your support and to this issue’s contributors and I hope you are getting ready for the driving season!! I’m happy to report that the 4th Annual Firebird Lawn Show at the Saratoga Automobile Museum was a complete success! The weather was almost perfect-sunny, warm and not too humid. This year’s show was the largest to date- 109 Firebirds, T/As, Firehawks, GTAs showed up in Saratoga from 9 states and Canada to share our love of Firebirds and raise money for the Special Olympics. A total of 4100 dollars was raised, another show record. Some of the cars at the show were-a 74 SD 455, a Notchback GTA, Notchback Formula, a #2 of 6 2002 Mecham Trans Am, 80,81, 89,96 pace cars, a Father (20th anniv. T/A) and Son (25th anniv. T/A), a 67 Firebird stuffed with a built 455, KITT, Bandits- most of them met up at a hotel and arrived at the show in one long line!! A bone stock 80 turbo Bandit T/A… well not exactly, under the hood was a twin turbocharged 455 putting out 848 hp at the rear wheels!! WOW. Talk about a sleeper!! Yes the owner had the dyno paper work to back up those numbers. Once again the quality of cars was amazing. I’d like to thank my fellow NFTAC members who made it to the show. Also the members of Firebird Nation of North America who attended and Trans Am Country- many who drove three, four and up to eight hours to get to the show. Thanks to Rob, Frank and NFTAC for providing items for the show. Hope to see you at the next show on July 7, 2007. 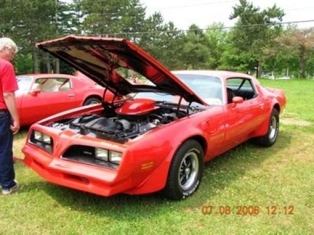 The 22nd annual Trans Am Nationals were held the weekend of August 25-27, 2006 in Dayton, Ohio. The staff of the National Firebird & T/A Club are always at this event because of the large number of Firebirds and Trans Ams that always are present. Sue Emmel and Becky Bayes and the rest of the “crew” did their usual fine job. The turnout was great and Trans Ams as there were approximately 600 Firebirds and Trans Ams with many fine examples of all generations. It was great to meet so many of our members at the show and we thank you for all of the many complements about the club itself. A great time was had by the attendees and the 23rd Annual Trans Am Nationals is scheduled for August 24-26, 2007. Take a look at all the great cars and we know we will see you there! Thanks to all of the new members that joined recently. Thanks also to Todd Stahr, Stevern Syverstsen, Robert Willander, Aaron Hoevenaar, Michael Schneider, Arnoldo Godoy, Fred Wilson and Joey Perkins and all of the other contributors to this issue! Also many thanks to Todd Stahr on his continuing technical help to our members on our new message board at www.firebirdtaclub.com. Speaking of which, the club has a new and much improved message board. This is something that many of our members have wanted for a long time. Be sure to check it out. You can access through the club website at www.firebirdtaclub.com or directly at board.firebirdclub.net. We have a members only section of the message board. To get full member access logon to the message board and post a message in the Access to Members topic and send us your membership name and membership number if known. Moderators for one or more of the topic are needed. Go to the message board and send us a message if you would like to be one. The club also now has a blog for club members to enter comments and information on. It is located at blog.firebirdclub.net. Please take advantage of this new forum and post your comments to it. 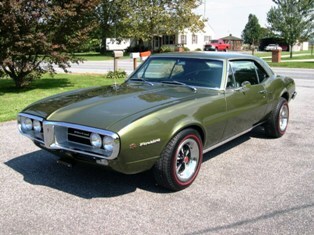 The Tarheel Tigers Pontiac Club is a new local chapter of the National Firebird & T/A Club. The club is for all Pontiac owners within 60 miles of Raleigh, North Carolina. The club president is Jim Ranieri and he can be reached by email at pontiacman@nc.rr.com. The club’s website is www.tarheeltigers.org. Also, the Central Florida Firebirds has been started by Jim Carlton & Matt Morrell. It serves the Greater Orlando area and if you are in the area contact them at 407-834-8366 or visit www.orlandowtw.com. The 2006 22nd annual Trans Am Nationals is now history. See the report in this issue. We now offer a 3 year membership or renewal rate which includes a free t-shirt. The rate is $95 or $2in the process! We would also like to welcome another new member of our technical staff. He is Joe Genara and he specializes in 3rd & 4th generation cars. Contact information is listed on our website and in the Technical Services section of this issue of the Eagle. As we stated previously, we are also pleased to announce a new service. We now offer eMembership at a reduced rate of $20 per year. This membership offers the eEagle and on-line access to the “Members Only” section of the website which includes on-line versions of the Eagle, tech staff contacts, member shop recommendations, etc. No membership materials will be mailed to this type of member. Remember we now have a new feature of our free classified service for members. As you know, classified ads are FREE to members but now you can add photographs of your items for sale. For $15 we will include a B & W photograph of your car or item and for $35 we will include a color photo. Also the classified ads will now appear on our Internet web site. Thanks for all of your support and to this issue’s contributors and I hope you are have a great fall season! !